An internal Navy report blasts the Food and Drug Administration for blocking clinical trials of a blood substitute manufactured by Biopure Corp., a struggling biotech company based in Cambridge. The Navy ultimately hopes to use the experimental product, called Hemopure, to treat military personnel wounded in battle, where traditional blood transfusions aren't readily available. But for the past four years, the FDA has consistently rejected Biopure and the Navy's efforts to test the product in clinical trials, citing safety worries and other concerns. Now the Navy has commissioned a strongly worded report, obtained by the Globe, that concluded the FDA reviews were "faulty." "The reviews had consistent patterns of erroneous, misleading, and anecdotal statements, reporting bias, changing requirements, no 'sense of urgency,' " as well as conflicts of interest. FDA spokeswoman Karen Riley said the agency recognizes the importance of developing products to help both military and civilian trauma patients, but must also make sure the trials do not "involve unreasonable risks to patients. There have been significant safety concerns raised about this class of products," Riley said, noting some studies linked the products to toxic effects, including heart and kidney damage. A Navy spokesman said it plans to submit an edited version of the report to research journals, but added it is premature to discuss the findings. The report, dated March 13, was written by Captain Daniel Freilich, a program director at the Naval Medical Research Center, along with 13 coauthors, mostly university medical professors. One of the report's academic coauthors said he has been frustrated by the FDA's resistance to allowing the Navy tests to go forward, because so many patients die of massive blood loss on their way to the hospital. "If we can get a blood substitute, it would make all the difference in the world," said Joseph Acker, executive director of Birmingham Regional Emergency Medical Services System in Birmingham, Ala. "It would probably save more lives than anything we could do in EMS." Still, blood substitutes have been dogged by safety concerns. Last year, the Journal of the American Medical Association published a study that concluded hemoglobin-based blood substitutes, such as Hemopure, are potentially deadly and should not be tested in humans. Biopure subsequently demanded a retraction and sued the coauthor of the article - a senior investigator with the National Institutes of Health - for libel, saying the study was flawed. Hemopure is manufactured from cow's blood. South Africa, the only country to approve Hemopure for human use, decided to revoke its approval last year following the Journal of the American Medical Association study. The company is appealing that decision. But a coauthor of the Navy report said the safety concerns are moot, because the Navy has proposed testing Hemopure in patients with severe blood loss who would otherwise likely die. 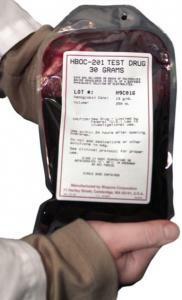 Last month, the Navy submitted a revised application to test the drug in trauma patients. "There is a huge need," said Lewis Kaplan, associate professor of trauma surgery at the Yale School of Medicine in New Haven, adding he was baffled by the FDA's resistance. But Biopure may be running out of time. The company was forced to lay off all but five employees to conserve its dwindling cash. In February, the company hired Newbury Piret & Co., a Boston investment banking firm, to advise on its strategic options. Biopure's stock closed at 17 cents yesterday, giving the company a market value of just $7 million. The company has also struggled to distance itself from several former executives. In 2005, the Securities and Exchange Commission sued Biopure and several former executives for misleading investors about Hemopure's prospects for approval. The parties ultimately settled. In addition, another former Biopure executive, Howard Richman, pleaded guilty last month to pretending to be gravely ill with colon cancer to avoid a suit from securities regulators. Richman, who left the company in 2003, paid a $150,000 fine last year and faces up to 10 years in prison. In October 2005, Biopure warned the FDA that the SEC probe presented a possible conflict of interest, because some of the FDA reviewers were also witnesses in the case against the company.